This is the first in this series of postcards. 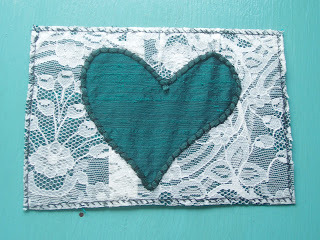 As I was cutting out the hearts for the ATC, I wondered what it would be like to use the lace with the heart cut out. This postcard was the opportunity to try it. I cut out the heart, then attached the lace to the silk. I then couched the satin cord around the outline of the heart using one strand of black DMC stranded cotton. I then did a row of small running stitching around the outer edge of the cord. I am already planning the next one which will use the second lace that was used for my wedding dress. Meanwhile, this card is on it's way to the USA. DS2 was taking some interest as this was coming together. Looking at the lace, he thought it reminded him of wedding dresses, so I told him where it came from. Then he looked at the silk. He was surprised about the texture of the silk, he thought it should be smooth like satin. It is the texture of silk that I like so much. I may not have got my little girl, but he is the next best thing. It is lovely to have someone to talk to that is interested in textures and what can be achieved with different textiles. I hope he doesn't grow out of it any time soon. Love the card, very pretty! So the dress lives on in more ways than one. The heart card is just beautiful. Great idea. Lovely postcard, Jane. Your little bloke sounds like he has a bright future, being interested in craftwork of so many varieties. You set a fine example! Love the post card...I've never tried one of those. Must do soon...very cute. That is a beautiful ATC. The contrast of the fabrics is fabulous. One bag complete and floss frustration.